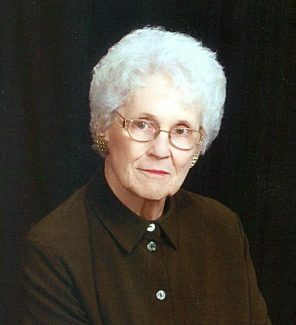 Vera M. Hoff, 84, of Greeley, passed away on April 8, 2018, from cancer at Fair Acres Manor in Greeley where she had been in rehab since breaking her ankle in January. She was born Aug. 19, 1933, in Greeley to Carl G. and Mary E. (Ilse) Will. Vera grew up on the family homestead east of Cornish, Colo. She attended school in Cornish through the eighth grade. She then came to Greeley and lived with Mrs. Becker while attending Greeley High School where she graduated in 1951. She attended Greeley Business College for two years. On April 1, 1953, she went to work for the Weld County Assessor's Office where she worked for 45 years, retiring Aug. 31, 1998. On Oct. 7, 1967, she married LeRoy Hoff in Greeley. They had a son, Mark. Vera enjoyed bowling, cross stitch and gardening and in retirement she enjoyed Meandering With Mary, and watching Jeopardy and Wheel of Fortune. She was a member of Greeley Wesleyan Church, and the Kersey Senior Center. She is survived by her son, Mark of Greeley; granddaughter, Amanda (Tim) Hitchcock of Orcutt, Calif.; grandson, Zacory White of Colorado; great granddaughter, Ashlyn Hitchcock of Orcutt; sisters, Margaret Rogers of Missoula, Mont., and Shirley (Jack) Degenhart of Fort Morgan, Colo.; sister-in-law, Viola Amen of Greeley; brother-in-law, Walter (Linda) Hoff of Fruita, Colo., and numerous cousins, nieces, nephews, and friends. Vera was preceded in death by her parents; husband, LeRoy, and her cat, Sissy. Life Celebration Services were April 16, 2018, with viewing one hour prior at Adamson. Interment was at Linn Grove Cemetery. Condolences may be left for the family at adamsoncares.com.